The crash happened on Loop 323 and Highway 271. TYLER, Texas — Tyler police are responding to a deadly two-vehicle pin-in crash on Loop 323 and Highway 271. 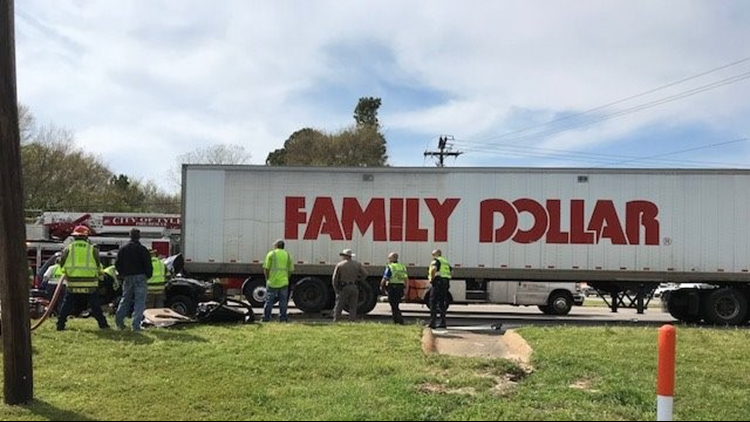 According to police, a Dodge Durango slid under a Family Dollar semi-truck. "The 18-wheeler what stopped at the light and he felt a bump on the back," Don Martin of Tyler police said. "And the Dodge Durango basically just slammed into the back of the trailer of the 18-wheer ." Police say the Durango caught fire, which was quickly extinguished by the truck driver and other drivers who joined the rescue effort. Rescuers pulled the vehicle from underneath the truck and attempted to save 62-year-old driver inside. EMTs thought initially man driver had died and police reported to the media the crash was fatal. "The driver then basically passed out. They thought he had expired at that time probably from whatever was going on internally," Martin said. However, emergency crews refused to give up on the man. "They were able to revive him, get him back, and then they immediately rushed him to the hospital," Martin explained. "We do believe he had passed away at one point in time and they brought him back." Police say the man is expected to survive. However, police worked the crash as a fatality crash in case the man did pass away. Police closed the northbound lanes of Highway 271 as police worked to clear the accident scene. The road has since reopened.